And, just when I thought I could smile any more, I was greeting by an email update this morning on the condition of Maestro James Levine ... who has been absent from the Met Opera following a series of debilitating health issues. The Met’s General Manager, Peter Gelb, announced on Thursday that the beloved Maestro will return to conducting on May 19, 2013 with the MET Orchestra at Carnegie Hall. He will then lead three operas in the Met’s 2013-14 season, including a new production of Verdi’s Falstaff and revivals of Mozart’s Così fan tutte and Berg’s Wozzeck. He will also conduct all three Carnegie Hall concerts that season. In recent weeks Levine, who is still recovering from a spinal injury due to a fall in August 2011, has already resumed some of his duties as the Met’s Music Director, coaching members of the Met’s Lindemann Young Artist Development Program, holding artistic planning sessions, and meeting with the Met’s Orchestra and Chorus. I’m feeling better with each passing day and look forward to returning to the company I love so much. It has been a long healing process, but with a team of excellent doctors and the unwavering support of my friends and colleagues, I’m looking forward more than I can say to getting back to work. Jim’s return to conducting is the welcome news that our company has long been waiting for, and it is also great news for opera lovers throughout the world. I know, I shouldn't be too critical of Gelb. With many in the opera world often asking when Mr. Levine would be back, Mr. Gelb was under pressure to make a decision about Maestro Levine’s long-term status. But, he said he would not do so as long as there was any hope at all that Maestro Levine would conduct again. That's certainly commendable on Gelb's part. 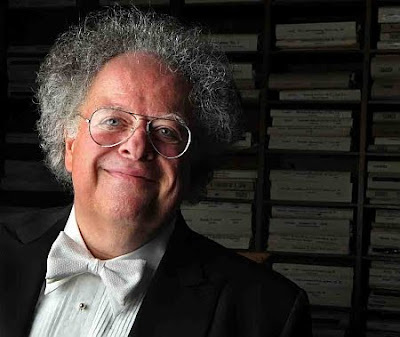 Maestro Levine has been in long-term rehabilitation since his fall and injury in August 2011, which required surgery and left him partially paralyzed. Based upon recent examinations, his team of physicians has expressed uniform optimism about his ability to resume conducting. While it is evident that he has regained his upper body strength, the injuries have left him temporarily unable to walk. For the time being, he will conduct from the motorized wheelchair in which he uses to get around. In anticipation of his return, the Met’s technical department is designing customized, elevating podiums that will be utilized on the Carnegie Hall stage and in the Met’s orchestra pit. 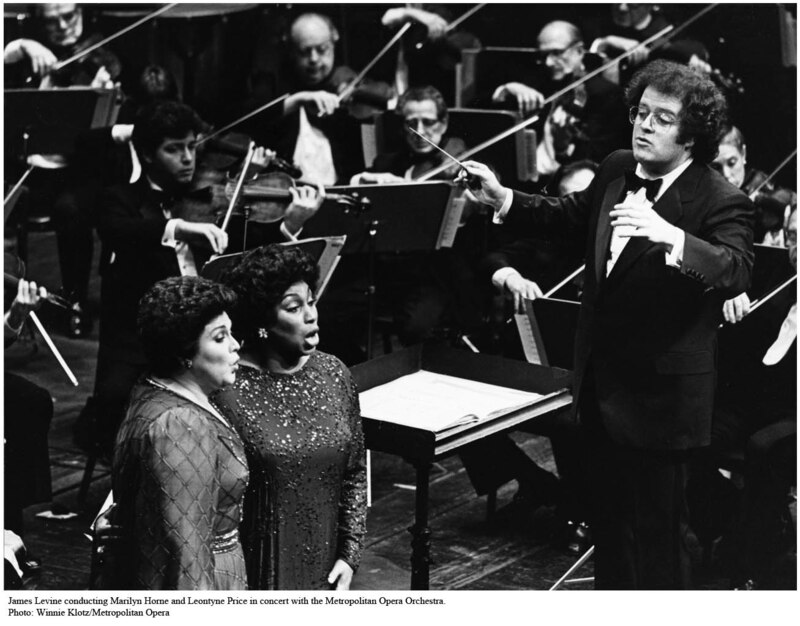 Maestro Levine conducts Marilyn Horne and Leontyne Price. To be honest, I'm very glad they're making these adjustments for Maestro Levine. It's only proper given his stature with the company and the opera world in general. Let's not forget that his 40th anniversary with the company was just celebrated last year. 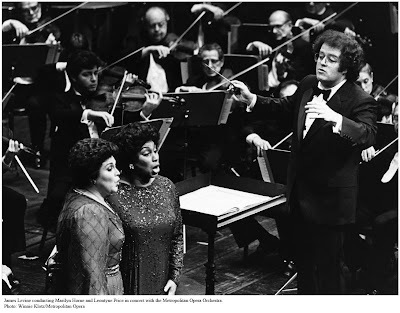 He debuted with the company in 1971 and later became the Met’s Music Director in 1976. Since his debut in 1971, Maestro Levine has conducted 2,441 performances - that's more than anyone in the company’s 129-year history. Conducting all of those performances, as well as a heavy travel schedule pertaining to his conducting abroad, left Maestro Levine's body in a state of breakdown. As you may remember, prior to his fall in 2011, Levine had undergone other surgeries to correct problems with his upper and lower spine, including stenosis, and fractured and herniated discs, which had caused severe and debilitating pain. But, above and beyond that, there was something that was going on with Maestro Levine that he chose not to disclose to the public in order to guard his privacy. Indeed, since 1994 Maestro Levine has been suffering from, and being medicated for, Parkinsonism, which is a relatively benign form of the disease from which it gets its name ... its considered relatively benign because it does not progress. Since 1994, Maestro Levine has shown symptoms of Parkinson disease. They mainly affected his legs and also caused a mild tremor in his left hand. Fortunately, the symptoms have changed little over the years and have been suppressed with medication. This lack of progression indicates a benign form of Parkinson’s, rather than the more typical form, in which symptoms steadily worsen. In the past, Maestro Levine’s symptoms were aggravated by the stress of severe back pain. Now that he is pain-free, his mild Parkinsonism should have little impact on his quality of life and his return to conducting. His upper body strength and dexterity are quite remarkable. The Met is extremely fortunate to have Fabio's strong presence in the pit. The orchestra and chorus admire him greatly and both Jim and I are very grateful for all that he brings to the Met with his artistry and continuing presence. Cheers and welcome back, Maestro Levine! The world looks forward to having you back on the podium.